Snapchat and Netflix are partnering for a first-of-its-kind World Lens — featuring a portal into a new world — for the launch of Stranger Things 2. 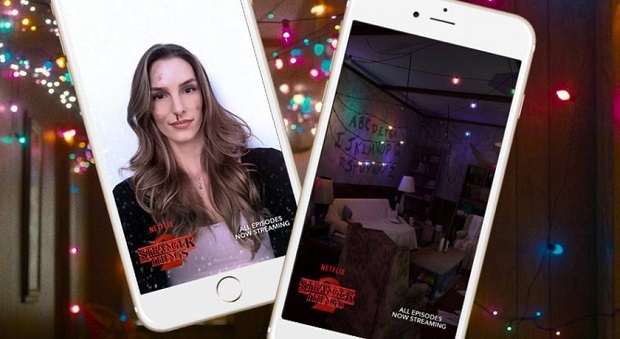 Snapchat’s first portal World Lens uses new technology to let you walk into another world — in this case, the “Upside Down” version of Joyce Byer’s famous living room. This is an augmented reality (AR) experience — you can move around inside, experience surprises, and even see back out through the door into the real world. Spooky fun! The Portal World Lens only works on iPhone 6S and above with iOS 11 installed. If you are not on an iPhone 6s with iOS11 and turn the camera around, you’ll see Byer’s living room in an interactive “gyroscope Lens” (so it’s the same experience as portal, minus walking through the door). For interactive easter eggs, tap on the objects in the room. Every Snapchatter, regardless of phone-type or OS, will have a face Lens that mimics Eleven’s nosebleed available in their app. Second, in another first for Snapchat, you can unlock the Lens by using Shazam in Snapchat when the Stranger Things theme song plays — such as watching the opening credits. · On average Snapchatters visit Snapchat 20 times every day to express themselves, play, and learn about the world. · Snapchatters spend on average 30 minutes a day on Snapchat (up from 25 minutes in Q2). · For Snapchatters aged 25 and under this rises to 40 minutes per day. · Over 60% of daily Snapchatters create content with the camera every day. · Snapchatters send over 3 billion Snaps every day, a run rate of over 1 trillion a year. · Snapchatters watch over ten billion videos on Snapchat every day. · There are over 173M daily Snapchatters worldwide and over 57m in Europe. · Over 25% of smartphone users in the U.S., U.K., and France now use Snapchat every day. · In May 2017 Snapchat announced 1 in 5 smartphone users in the Netherlands is a daily Snapchat user, and over 70% of Snapchatters in the Netherlands are 18 or over. · In the US on any given day, Snapchat reaches 41% of all 18 – 34 year-olds in the U.S.